The Aspire ET-S Glass is a beautiful atomizer that screams quality from the very second you lay your eyes on it. The mouthpiece funnels the vapour so well and looks/feels very luxurious when vaping from. The Aspire ET-S has a glorious 2ml glass tank that enhances every e liquid flavour available. The glass tank is reinforced with an alliuminiun sheild that has a visible window to view the liquid in the tank. The Aspire ET-S is powered by a dual coil atomizer and packs a very nice throat hit and creates a lovely vapour cloud. It comes in 5 different colours black, stainless steel, red, blue and pink so you really can match any battery to this amazing tank. The only downside to this atomizer is that it can drain your battery slightly faster than a single coil tank due to the amps required to power this beast of a tank. It is one of the highest quality atomizers on the planet in its price range. 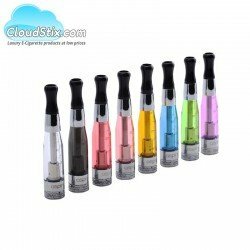 It has dual coil atomizers which deliver fantastic throat hit and vapour clouds. It costs very little to replace the atomizers. The Glass tank really enhances the flavour of the e liquid. It holds a really nice 2ml of e liquid. The atomizer can be changed whilst liquid is still inside.